This class will be perfect for anyone who wants to learn the basics of creating pottery on a pottery wheel or someone with little experience who wants to further develop their skills. Learn essential wheel-throwing techniques from centering to trimming. 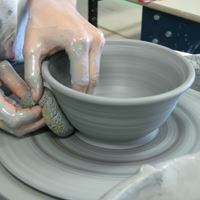 Mugs and small vases will be the first forms we practice throwing on the wheel. Then enhance these pieces with hand-built elements such as handles and decorating the surfaces with underglaze, sgrafitto, and more. This class will give the student with little or no experience the opportunity to learn and develop a basic set of wheel-throwing skills. After taking this class, the student will take with them a small collection of functional wheel-thrown pottery as well as the confidence and skills needed to create more advanced pieces in the future. Fee includes up to 25lb of clay, glazes and firing. Please bring to class an apron and hand towel. Each student must bring their own pottery tool kit (available at local craft stores or online).